I used to love cheese and jam sandwiches (come on, who doesn’t love a bit of cheddar and strawberry!?). Sadly, I don’t have them that much anymore, so I think this salad is probably my subconscious telling me to have more cheese and jam moments. This is very quick to make and is made up of (as the name suggests) cherries, feta and quinoa (with some sneaky walnuts in there too). That’s all kinds of goodness. The cherries lose their flavour if they are chilled, so if I make this in advance and keep it in the fridge, I keep the cherries separate and add them last. It actually feels a bit silly writing instructions for this as it's so simple. But, I will persevere. Wash and cook your quinoa (as per the instructions on the pack). Do this in advance so it's cooled when it goes in the salad. I usually cook a bowl of it at the start of the week so I can add it to meals as I go. Here's hoping we don't suddenly find out that quinoa is actually quite bad for your health, because I would be in quite the pickle if that happened. Cut and de-seed your cherries. I would probably add more cherries if it wasn't so annoying to go through this chopping/de-seeding process. If you're a more patient person than me, chop those cherries to your heart's content. 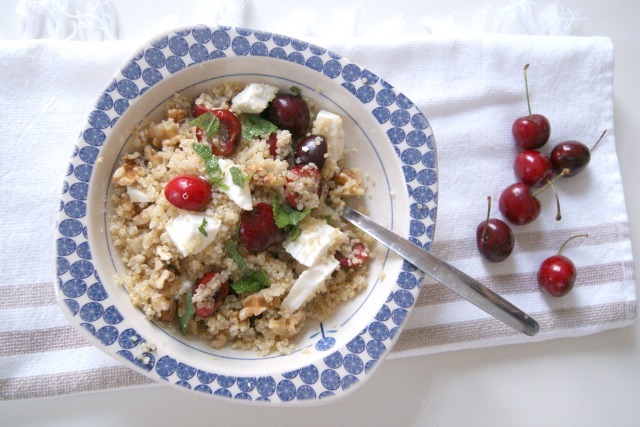 Mix together the quinoa, cherries, feta and walnuts. Squeeze over the lemon, which along with the cherries, means you have enough juice to not need a separate dressing. Add the mint on top (to give yourself extra summery points) and you're done. As ever, I love to read your comments! You can follow me on Bloglovin if you’d like to see more.